Home / Clearance / T&S Brass B-3942-01 Twist Waste Drain Valve w/ Overflow, 3" X 2"
T&S Brass B-3942-01 Twist Waste Drain Valve w/ Overflow, 3" X 2"
Also known as Rotary Waste Valve (RWV), the twist handle valve allows water to drain without reaching into sink that may contain sharp or unseen objects. When ordered with the "-01" suffix, the optional Overflow Assembly prevents unsanitary overflow when the valve is in the closed position. 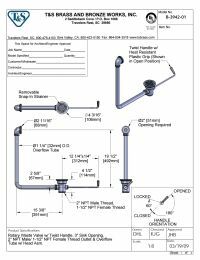 Note: Order item # B-3940-01 for optional NPT or BSP Drain Adapter that allows for a 1-1/2" or 2" outlet.